No yard, no worries! You can still compost all your left over food and even paper. You can start with a worm bin. GROSS!?! Worms? Real live worms? Yes, they eat your food and produce waste which breaks down the material in your bin much faster. Vermiculture, or worm composting, allows you to compost your food waste rapidly, while producing high quality compost and fertilizing liquid. Best of all, it’s self-contained and nearly odorless. You can do create your bin in a 5 gallon bucket or an 8-10 gallon plastic storage bin (with a lid of course) and tuck it under your sink or in your laundry room. Cover: The bin should have a cover to prevent light from getting in and to prevent the compost from drying out. If you use a plastic bin or bucket use the lid that comes with it (don’t forget to dril some holes in the top) You could also use a sheet of dark plastic or burlap sacking placed loosely on top of the bedding as a sufficient cover. Prepare the box for worms. Prepare bedding for the worms by shredding Newspaper into 1 inch strips. (You can also use thin strips of unbleached corrugated cardboard, straw, dry grass, or some similar material.) Worms need bedding that is moist but not soggy. Moisten the newspaper by soaking it in water and then squeezing out the excess water. 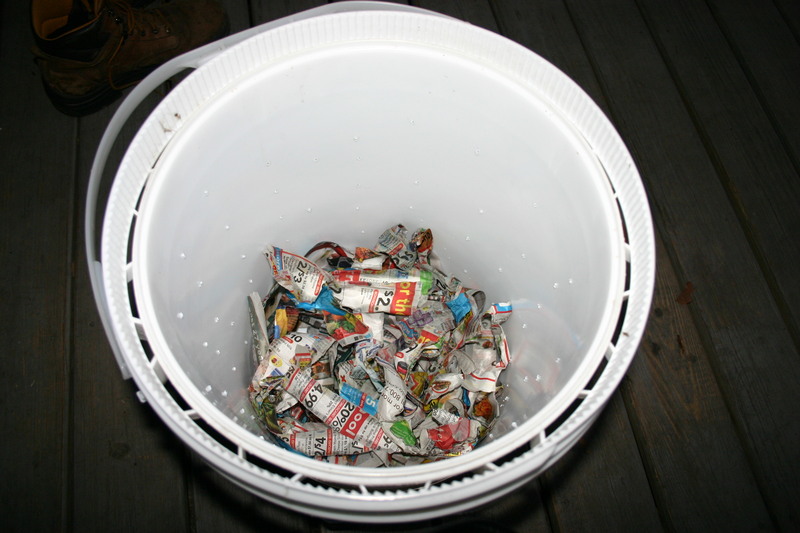 Cover the bottom of the bin with 3-4 inches of moist newspaper, fluffed up. (Do not press down on the newspaper. The worms need lots of loose, fluffy bedding in which to move through and get enough air.) If you have any old leaves or leaf litter, that can be added also. Throw in a handful of dirt for “grit” to help the worms digest their food. Feed and care for the worms. Sprinkle the surface with water every other day, and feed your worms vegetable scraps at least once a week. Feeding lightly and often will produce more worms (which is good when starting a new bin) and large amounts fed less often will fatten your worms (good for fishing). Add more cardboard, shredded newspaper, hay, or other fibrous material once a month, or as needed. Your worms will reduce everything in your bin quickly. You will start with a full bin of compost or paper/cardboard, and soon it will be half full. This is the time to add fibrous material. What kind and how many worms do I need? Get worms. There are several varieties of worms that that are bred and sold commercially for vermicomposting; just digging up earthworms from your backyard is not recommended. The Internet or local gardening club is your best bet for finding a worm vendor near you. The worms most often used, Eisenia foetida (Red Wigglers), are about 4 inches long, mainly red along the body with a yellow tail. Another variety to consider are Eisenia hortensis, known as “European Night crawlers.” They do not reproduce quite as fast as the red wigglers, but grow to be larger, eat coarser paper and cardboard better, and seem to be heartier. They are also better fishing worms when they do reach full size. How many? One pound of worms can handle 1/2 pound of food scraps per day. For example, if your food waste averages 1/2 lb. per day, you will need 1 lb. of worms or a 2:1 ratio. There are roughly 500 worms in one pound. If you start out with less than one pound, don’t worry they multiply very quickly. Just adjust the amount that you feed them for your worm population. For a 5-gallon composter, 1 lb. of worms is plenty to start with. The larger you make the container, the more worms it can sustain. My worms are doing the job! Now what? Harvest your compost. After about 2 months, your worms will have completed a large portion of their job in your compost bin. When you add bedding, pull the existing compost and bedding to one side of the composter and add new bedding on the now empty side. Also, add your food scraps only on the new half. This will encourage the worms to migrate to the “fresh” side and will make it easier to scoop out your finished compost on the old side. There are still likely to be worms present in the harvested compost, so gently pick them out and return them to their home.